John Baker’s motto is “Dream. Try. Win.” I think he means if you dream hard and try hard, you will win anything. This helps him because he believed he could win the Iditarod and he set a record. This also has meaning in my life. When I want to win something I can’t just expect it to be handed to me. I have to dream and try to have a shot. I really understand this advice. I think “Dream. Try. Win” means if you dream you are winning and you try, you’ll win. I think this applies to my life. I dreamed that I’d pass a test and I did. John Baker did dream about winning the Iditarod and he did try and he did win. He got he fastest time and the time is 8 days, 18 hours, 46 minutes, and 39 seconds. 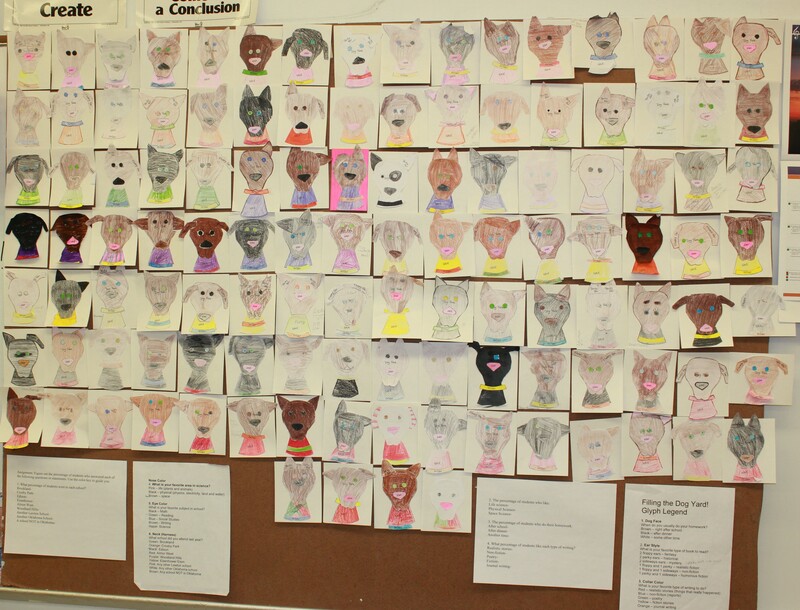 Susan Smith from Lawton, Oklahoma shared this picture of the Puppy Glyphs her 6th grade science students made… all 116 of them! That’s a lot of puppies! What Change Has Had the Biggest Impact on the Race? In my opinion, the biggest change that has impacted the race is the sleds. One reason why I think that is because of the heavy wood sleds back then. It was heavy, plus the survival stuff that the mushers carry. Another reason why I think this is because it makes the dogs tired by pulling that much weight. And that decreases the chances of the mushers wining the race. That’s why I think the sleds have been the biggest impact on the race. I think the mushers cooking food has had the biggest impact. I think it is very positive because mushers wasted so much time cutting down trees and building fires. I think that mushers used to waste do much time cooking things in the old days. The mushers were also in danger of dying because they wasted so much time they could have died of hunger and thirst. They also were letting other mushers pass them while they were still cutting down a tree. So I close in saying that cooking in the old days was a terrible way to cook. In my mind the biggest change in the Iditarod and the eleven day difference is because every day or two the mushers in the first Iditarod had to chop down a tree to build a fire and get some sleep. Plus the dogs had to pull a heavier sled. Now the dogs get all the stuff they need in a can of dog food, but back then they had to have five different foods. That’s what I think sped up the Iditarod. I think the biggest and most important change is dog breeding. This is the biggest change because it is totally different from the first Iditarod. People used to breed malamutes. Now they breed huskies. This change made an impact on the Iditarod because huskies are faster and still strong. It is amazing how the Iditarod has changed. Click here to read our book! Are Mushers as Athletic as their Dogs? I think that mushers have to be as athletic as their dogs because if a musher is out of shape the dogs will have to pull more weight, therefore slowing the team down. If a musher is not athletic and in shape he will have to take frequent breaks, letting other mushers pass the out of shape musher. Dallas Seavey is a great example of an in-shape musher. Dallas won the 2012 Iditarod because he could run behind the sled to lighten the load for his dogs. Dallas did all of his training to help his dogs. All mushers should do that. If mushers don’t get in shape, it is just cruel to their dogs. I think mushers do have to be a little athletic to run the Iditarod. One reason is so they can keep up with dogs like Dallas Seavey did. Also because mushers have to be quick in putting harnesses on like athletes need to be quick in races and sports. Lastly because you need some experience in tough challenges for the Iditarod. That is why I think mushers have to be almost as athletic as their dogs. I think that the mushers don’t need to be as athletic as the dogs. The mushers need to have some athletic ability to run the Iditarod, but not as much as the dogs. The proof from the text is that Jim Lanier at 71 years old ran the Iditarod and was the first one to Cripple which is the half way point. I know that the dogs are better athletes then the mushers because the dogs actually run the 975 miles. In conclusion, the dogs are much better athletes then the mushers.